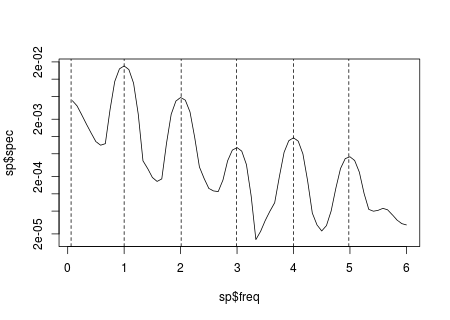 Could anyone tell of a good technique to reliably detect and estimate the frequency at which the peak occurs in such spectra (i.e., I want to estimate the frequency indicated by the blue line)? I am using R for my data analysis and would need a solution in R.
You can think of it as a problem of analytically locating the local maxima that are graphically observed. The code below locates those maxima by means of a one-dimensional optimization algorithm that is applied across overlapping intervals that cover the entire x-axis. At each interval the objective function is defined by spline interpolation of the sample periodrogram. I think there is a more complete implementation of this idea somewhere in a package or post, but I could not find it. Next I define the objective function, the intervals that are checked for the presence of local maxima and some thresholds for the gradient and Hessian that will be used to decide whether or not to accept the solution as a local maximum. Now run the optimization algorithm for each interval. The gradient and Hessian are computed numerically by means of the functions grad and hessian from package numDeriv. Not the answer you're looking for? Browse other questions tagged r spectral-analysis or ask your own question. What is the main idea behind the power spectrum? Covariance and power spectral density of a signal?